Painting & Prints of Cove Bay Harbour - Berwickshire, Scottish East Coast. 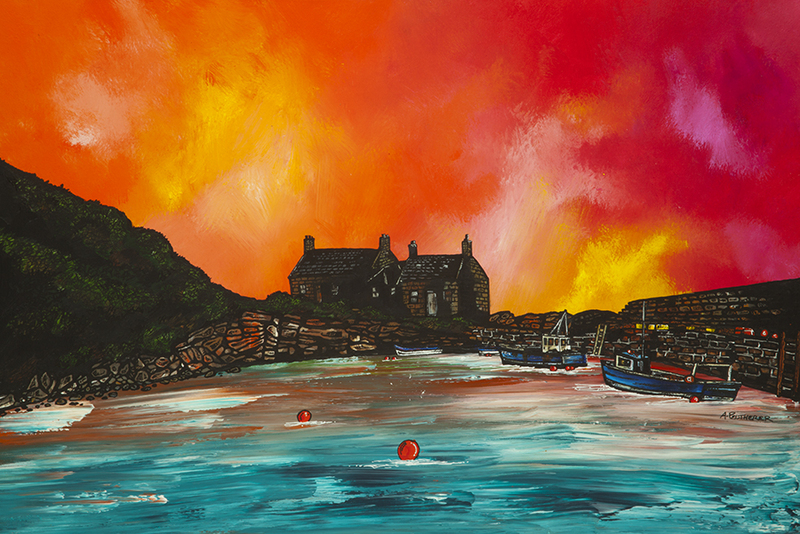 An original painting & prints of Cove Bay Harbour, Berwickshire on Scotlands East Coast. A dramatic mix of mediums are blended,splashed, layered & splattered over the canvas to produce a very atmospheric painting. This effect depicts the ever changing (fierce & cold)weather (fierce & cold) that constantly sweeps across the East coast of Scotland. I love to combine & layer the different types of paint & application of medium, creating a unique style of atmospheric painting. Hopefully the result is full of vibrant colour and drama. Many of my paintings are very striking graphic style, using bold outlines against bright, vibrant spray painted skies. I use a variety of mediums in a very non traditional style including spray paint, oil paint, acrylic, inks. Also whatever other mediums of materials i can lay my hands on! My original paintings continue around the deep edges of the canvas giving a very contemporary style although they can be framed if you wish. This original painting is on sale, reduced from £595 to £395. Prints from £15 are available to buy. (UK Shipping is FREE. International at a wee bit extra). Edinburgh Paintings & Prints - Cove Bay Harbour, Berwickshire, Scottish East Coast.